Are you all about the pumpkin right now? I totally am. I know everybody complains about the plethora of "pumpkin spice" flavored products this time of year, and they have a point. But I am a big fan of adding real pumpkin to all kinds of stuff. Most pumpkin recipes you see around are sweet, but I love adding pumpkin to savory dishes. Remember my Pumpkin Cheddar Muffins, Pumpkin Beef Curry, Pumpkin Sausage Baked Pasta, Garlic Pumpkin Mashed Potatoes, Pumpkin Alfredo Sauce, Pumpkin Black Bean Enchiladas, and Pumpkin Sage Polenta? Wow, I have more savory pumpkin recipes than I realized! This is a recipe I created last fall. I'm not sure what inspired me, but I just kind of threw it together and it came out perfectly the first time. I love it when that happens! 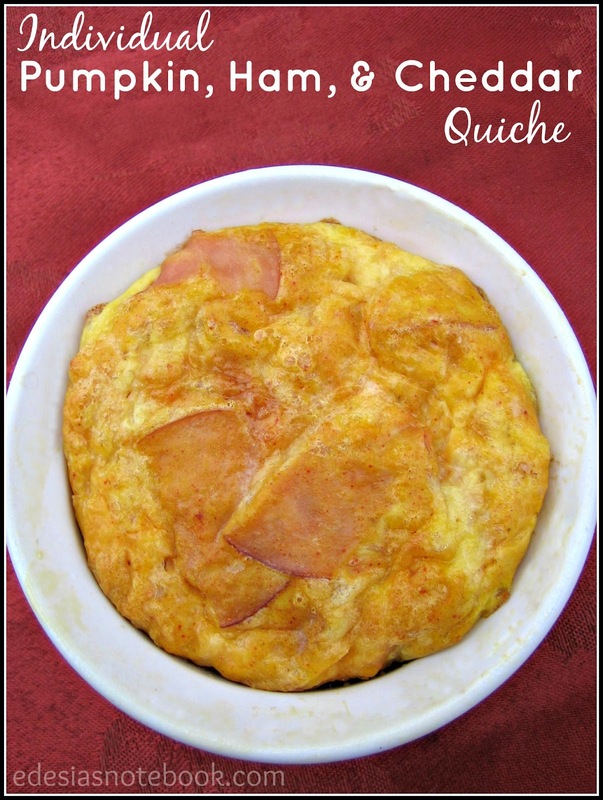 Pumpkin, ham, and cheddar are really great together, especially with eggs. Preheat oven to 350°. Coat a 7 oz. ramekin with baking spray. Combine all ingredients in a small bowl. Mix well and pour into prepared ramekin. Bake for 35 minutes, or until eggs are set in the middle. Remove from oven and let cool a few minutes before serving. Preheat oven to 350°. Combine all ingredients and mix well. Pour into pie plate (can use a pie crust, if desired). Bake for 45 minutes, or until eggs are set in the middle. Remove from oven and let cool a few minutes before cutting and serving. I like to make these in my little individual-sized ramekins, but I included the directions for making a 9" pie-sized quiche as well. The little ones are nice because they cook up more quickly. And they are the perfect serving for an adult. My daughters usually split one. I also have a 16 oz. dish just like the ramekins, so I double the recipe for that one and cook it about 10 minutes longer. My husband and I can split that one. When the first come out of the oven, they will have puffed up beautifully. They will kind of deflate a little bit as they cool, but they will still look nice. I feel pretty good serving these to my kids. Not only do they have all kinds of protein from the eggs and the ham, but have you seen the nutrition info on canned pumpkin? That stuff is loaded with vitamins. These reheat pretty well in the microwave, so I usually make several at a time. The leftovers are great for a quick protein-packed breakfast.